I didn't get a chance to buy more batteries the next day (at that point, realizing we probably hadn't ever changed the batteries, we decided to replace all seven of them), but that night the plot thickened. Around 11 pm (before we had gone to sleep, fortunately), another unit went off. We did some troubleshooting but were unable to silence it, so we took it down. Then another went off. We took it down. And so on, until five of the seven units were removed. And then we knew that it couldn't be batteries going bad, since it was incredibly unlikely that five batteries would go bad within 24 hours. Around that time we also realized that we weren't really sure whether it was the smoke or CO part that was going off. They have a different light for each alarm and are supposed to sound differently as well, but being sleepy and without the manual in hand, we couldn't immediately figure it out. That was our first hint that the combination smoke/CO detector was perhaps not the brilliant invention we had assumed it was. Here's where I feel like I should reiterate that, if your CO alarm goes off, you should immediately leave the house and then call 911. But that's not what we did -- because we knew it was a false alarm. How were we so sure? How'd we know we didn't have a legitimate CO problem? We're in the unusual situation of our only gas appliances being the fireplace and the range (the HVAC is geothermal, the water heater is electric/geothermal, and the dryer is electric), and since neither one was on, they couldn't be producing carbon monoxide. (We spent a while talking through whether a gas leak somewhere in the house could trigger the CO alarm but eventually concluded -- correctly -- that it couldn't. CO is produced through the combustion (burning) of gas, so without a source of combustion, we couldn't have CO or a CO leak.) In an overabundance of caution, we also checked that neither car was accidentally left on, since cars running in the garage can allow CO to enter the house (with lethal results), but all was good there, too. Plus, neither the standalone CO detector nor the other two hard-wired detectors had gone off even once through all of this. We were at a loss. We replaced the batteries the next day, but the same five units promptly sounded again. So we knew it wasn't the batteries, there wasn't a fire, and we didn't have a CO leak. It seemed like it was a pure malfunction that had begun in one unit and had somehow spread to four others. I checked with our builder to see if he or his electrician had any experience with that kind of issue. Nope. I called the manufacturer's customer service line, but the person I spoke with refused to acknowledge any explanation other than that we had a CO leak. (Never mind that it had been several days by then, and we weren't dead.) He suggested that I reset all of the units and put them outside, where our CO leak couldn't possibly trigger them. All five went off within half an hour. Our builder tried calling the manufacturer, hoping to get someone with more technical expertise than the customer service representative I spoke with, to no avail. So we were left with replacing the five units. 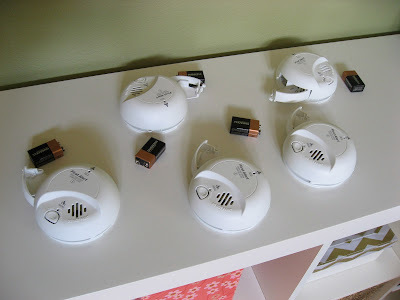 If we had it to do over again, we would have opted for smoke-only detectors (without the CO function) in the first place and just bought two or three plug-in CO detectors to install around the house. We didn't realize that smoke detectors typically last for 10 years, but CO detectors are only good for 5 to 7 years, so we'd be looking at replacing (or at least supplementing) all seven units well before the smoke detector part would go bad. (We spec'd combination units with the intention of tying them into the security system so that 911 would automatically be alerted to a fire or CO leak, but we ended up going a different direction with the security system, and knowing what we know now about how buggy the units can be, it could definitely be problematic for the fire department to be called for every false alarm.) So when I called the manufacturer (First Alert) back to pursue replacement under the warranty, I asked if they would send me seven smoke-only detectors instead of five combination units -- and they did, so (with the purchase of a new standalone CO detector and plans to buy a replacement for our old one) our curious saga was nearing its conclusion. I'm not up on all of the city garbage department's rules, but I'm pretty sure plutonium is not allowed. (Just kidding. They actually contain Americium 241. But Americium is made with plutonium, and it's still radioactive.) So I googled around a bit, and although I still haven't found an answer for the smoke detectors, this ehow article taught me two interesting things: 1. Some of the pieces of the CO detector casing may be recyclable. 2. When disposing of batteries in the trash (which is fine for regular alkaline batteries), wrap them in something or otherwise keep them separate from other batteries. (If two touch, they can become "live" and heat up or even leak.) Good to know. Coincidentally, while all of this was going on, I learned that there's just one brand of CO detector that's truly reliable. (And First Alert isn't it.) 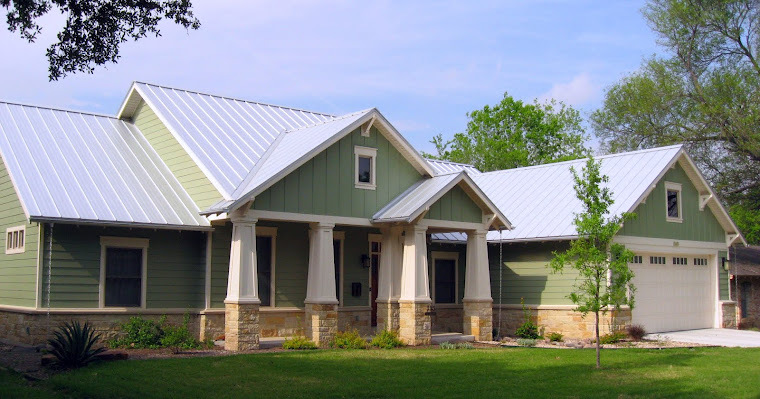 Kristof Irwin, a building science expert and the owner of Positive Energy, introduced me to CO-Experts, a pretty crazy-looking website created by George Kerr, the (rather elderly) authority on CO issues. 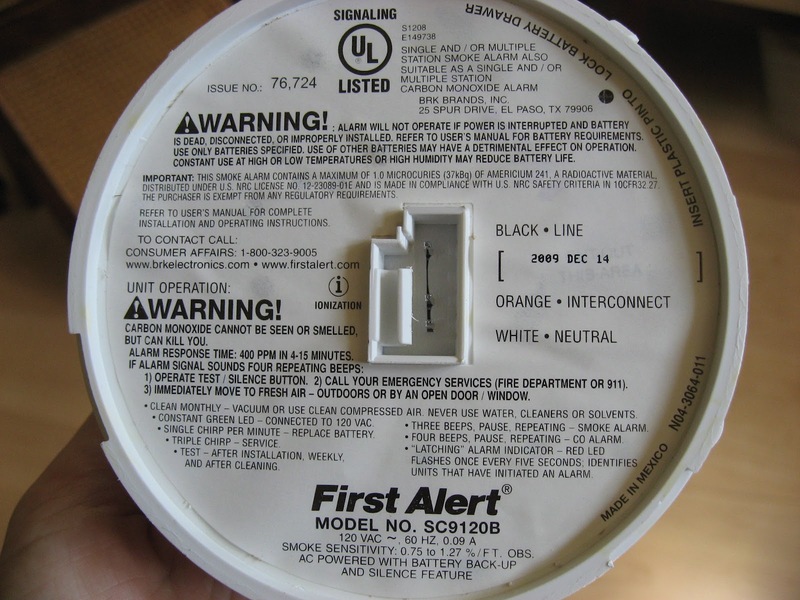 Apparently, to be able to sell a "carbon monoxide detector," a company has to obtain the certification of the Underwriters Laboratories (UL). And apparently the UL is overly concerned about avoiding false alarms, so they will only certify units that will not sound below 70 parts per million (ppm) of carbon monoxide -- and, indeed, will only sound after one to four hours of exposure at that level. That's more or less fine for healthy adults, but according to Mr. Kerr, that level of exposure can be very dangerous for children, pregnant women, or people with health challenges. So he has developed his own unit, being sold as a "health monitor," which has a display of the exposure history that can be helpful in treating carbon monoxide exposure (although it's unlikely to be necessary, as the alarm will sound immediately, even with very low levels of exposure). It's pricey -- $249, compared to about $30 for most UL-listed units -- but I'm convinced it's worth the cost. Oh, and one more tidbit from CO-Experts: since hotels are by no means immune to CO leaks but hotel rooms rarely have CO detectors, it would be wise to bring one with you when you travel.